The Astra nameplate originates from Vauxhall, which had manufactured and marketed earlier generations of the Opel Kadett (the Kadett D (1979–1984) and Kadett E (1984–1991)) as the Vauxhall Astra. Subsequent GM Europe policy standardised model nomenclature in the early 1990s, whereby model names were the same in all markets regardless of the marque they were sold under. As of 2019, there have been five generations of the Astra. In a fashion typical for Opel they are designated with subsequent letters of the Latin alphabet. Opel's official convention is that the Astra is a logical continuation of the Kadett lineage, thus, the first generation of Opel Astra as the Astra F (the last Opel Kadett was the Kadett E). The usual convention would have started with Astra A, if the Astra had been considered a separate model. Models sold as Vauxhall, Holden, or Chevrolet have different generation designations reflecting the history of those nameplates in their home markets and their naming conventions. The Opel Astra F debuted in September 1991. With the Kadett E's successor, Opel adopted the Astra nameplate, which was already used by Vauxhall for the Kadett D and E (see Vauxhall Astra). It was offered as a three- or five-door hatchback, a saloon (sedan), and an estate (wagon) known as the Caravan and available with five doors only, bringing Opel's run of three-door wagons to an end at long last. A cabriolet was also offered, designed and built by Bertone in Italy. While the Astra F finished production in Germany in 1998, Polish-built Astras remained on offer in Central and Eastern Europe, as well as Turkey, with the name Astra Classic from 1998 to 2002. 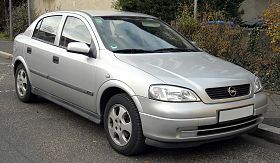 The Opel Astra F consisted of two main revisions and was revised in 1995, with the launch of Opel's new Ecotec engine. Aside from the South Africa-only 200t S, the lead model was the GSi – a 2.0 L I4 16V petrol injected model with 151 hp (110 kW), available as a three-door only. It also featured sports bodykit and widened front seats in the interior. However, this was substituted in 1995 and was renamed as SPORT, although only a limited number were produced and the bodykit was removed also and it could be selected with the lower-powered, but more modern 'Ecotec' version, the X20XEV (136 hp, 100 kW) parallel with the C20XE. In Europe from 1994 all Astra models were offered with the 2.0 L 16V Ecotec X20XEV parallel with the 2.0 L 8V (C20NE) engine, but the three-door and station wagon models could be selected with the 151 hp (110 kW) C20XE engine. Some Astra models had a 1.6 L engine with 83 hp. After the Astra F was replaced by the new generation Astra G in 1998, the so-called "REDTOP" C20XE engine was also taken out of production. The model was also launched in South Africa in 1991, where it was produced under licence by Delta. The "Kadett" name was retained for the hatchback Astras until 1999. The sedan and station wagon models were offered under the Astra name. The Kadett and Astra in South Africa won the title of 'Car of the Year' in two consecutive years (1994 and 1995) even though they were versions of the same car. South African nomenclature was denoted in centilitres, so the Astra and Kadett ranges featured 140, 160i, 180i and 200i models. The South African Astra turbo included a variant with the same turbocharged engine called the Opel Kadett 200t S. The 200t S was a specific name where Delta Motor Corporation wanted to show the specialty of the type, which could beat the BMW M3 in a quarter mile in that time. The "t" stands for the turbocharger. The engine (C20LET) in the Opel Astra and Kadett 200t S was sourced from the Opel Calibra and Opel Vectra A 4x4 2.0 16V turbo, four-wheel drive found in European markets, but local engineers converted the six-speed, four-wheel drive transmission (Getrag F28) to front-wheel drive only and as such it was unique to South Africa. The Opel Astra also became available in Australasia badged as a Holden, first in New Zealand in 1995, and then Australia in 1996. The first models were imported from the UK, but later models were imported from Belgium. The Holden Astra name had previously been used on rebadged Nissan Pulsar models from 1984 to 1989. Opel Astra's first generation was exported to Brazil from December 1994 as the Chevrolet Astra, possible because of a lowering of import tariffs. General Motors do Brasil sent the 2.0-liter, 115 bhp engines to Belgium, whence the completed cars took their way to Brazil. In February 1996 the Brazilian government again changed the import tariff, from 20 to 70% - making the car prohibitively expensive and leading to its cancellation after just over a year on the market. Instead, the locally built Kadett was updated. The second generation Astra was manufactured in Brazil. Beginning in March 1995, the Astra sedan was assembled in Indonesia where it was marketed as the "Opel Optima". The name had to be changed since PT Astra was Toyota's long operating local partner in Indonesia. In India the Opel Astra was assembled for the local market in a joint venture with the Birla Companies, beginning in 1996. Indian production ended in 2002. The first generation Chrevolet Astra in Brazil had a Vauxhall-style front grille featuring a "V", containing the Chevrolet badge. The Astra G was launched in Europe in 1998. It was available as a three or five-door hatchback, four-door saloon, five-door estate (in Opel tradition, known as a "Caravan") and two special versions from 2000: the Astra Coupé and the Astra Cabrio, both of them designed and built by Bertone. The Astra G saw the introduction of a natural gas-powered engine. Its chassis was tuned by Lotus and formed the base of a 7-seater compact MPV, the Opel Zafira. Approximately 90,000 coupés were produced, of which 7000 were cabriolets. The manufacturing of the Astra saloon and Caravan continued at Opel's Gliwice plant in Poland after the debut of the next-generation Astra H, with the older model being branded as Astra Classic in a similar fashion to its predecessor, catering to the lower end of the market. This car was offered in Central and Eastern Europe, as well as Turkey with the name Astra Classic II from 2004 to the end 2009. Apart from European markets, these models were also sold in Australia and New Zealand as the Holden Astra Classic, until they were replaced by the Holden Viva (built in South Korea) in 2006. The Astra G was built as Chevrolet Astra in Brazil. It was facelifted in 2003, and was sold in Brazil, Argentina, Mexico, and other Latin American markets until 2011. The GM Brazilian 2.0 8V inline-four engine which equips the Astra has the "flexpower" technology, that allows the car to run on both petrol and alcohol fuels, providing 128/140 hp (G/A) at 5200 rpm. A taxi version of the Brazilian sourced model, powered with gasoline 2.0 engine was sold in Chile as the Chevy Urban. In 2004, GM's Russian joint venture GM-AvtoVAZ launched the 4-door version of the Astra G as the Chevrolet Viva. It was sold through Chevrolet dealers in Russia, while Opel dealers were selling the newer Opel Astra H. Sales were poor from the start due to high pricing: the only version launched was equipped with a 1.8L engine with an above-average trim level, placing the Viva's price above the Toyota Corolla. A project costing $340 million was selling less than a thousand cars annually (801 cars in 2007); rumours of shutting down Chevy Viva production circulated as early as summer of 2005. GM-AvtoVAZ shut down small-scale production of the Viva in March 2008. The Astra G series Coupé was used for the silhouette racing cars in the DTM series. These DTM racing cars are purpose built race cars with barely any parts taken from the road cars except for lights and door handles. The car's bodywork featured gull-wing doors that were each supported by two gas struts. The racing cars were powered by 4.0L V8 engines with nearly 500 hp (370 kW). Opel did poorly during several seasons of DTM as only Manuel Reuter placed significantly in the championship once, taking second in the inaugural season 2000. Opel won the 24h Nürburgring in 2003, though. The Astra Xtreme, a concept car presented at the 2001 Geneva motor show, was a single-production V8-powered Astra based on the G-series Astra DTM. Like the DTM racing car, it featured a 4.0 litres (240 cu in) V8 engine, producing 444 hp (331 kW), gull-wing doors supported by gas struts, carbon fiber panels, and race-specification interior with five-point seatbelts. The season of 2005 also joined the history of Stock Car. In addition to the category becoming multi - the first time the Mitsubishi Lancer ran alongside the Chevrolet Astra, on 30 October 2005, 40 cars with Stock Car V8 engines performed an unprecedented race outside of Brazil worth points for the championship. It was a round to the side of TC 2000, the main category of Argentina and in July had run in Curitiba (Autodromo Internacional de Curitiba). The Autódromo Juan y Oscar Gálvez got a crowd of 70,000 people. Giuliano Losacco was the winner, with Mateus Greipel second and Luciano Burti third. The engine was a V8 Chevrolet 350 imported from the United States by JL, similar to that used in Busch Series, the second category of NASCAR, equal and limited to 450 hp (336 kW). The automaker GM was now sponsoring the category, providing the fairing of the Astra, making room for other manufacturers to enter the category with a low investment. The Astra H was launched in March 2004 as a five-door hatchback, whilst a five-door estate launched late 2004 and a sporty three-door hatchback, designated the GTC (Gran Tourismo Compact) for European markets, Sport Hatch in the UK and the Coupé in Australia, launched in 2005. The GTC has the option of a windscreen called "panoramic windscreen" (unique for a production car at the time of its launch) which extends into the roof area. Based on the new Delta platform, its size was increased compared to the previous version. Production came until the end of 2009, excepting the TwinTop which continued to be manufactured until November 2010. The aging Vectra B was replaced in Brazil with a sedan version of the Astra H, named Chevrolet Vectra, until it was replaced by the Chevrolet Cruze in 2009. The model was matched with the others models offered in Brazil. This version was offered as an Opel in some Eurasian markets in 2006, following a debut at the international auto show in Istanbul, Turkey, including Ireland in 2008. This was manufactured in Gliwice, Poland. Also in 2006, the Astravan, a 3-door van variant of the estate, was launched. In September 2007, a version of the 5-door Astra was launched in Brazil, marketed as Chevrolet Vectra GT to differentiate from the already existing Astra, which was replaced by the Chevrolet Cruze hatchback in 2011. The Chevrolet Astra was withdrawn from Mexico in 2008 as a result of withdrawal of Opel products from the brand, replaced by the Chevrolet Cruze sedan for the 2010 model year. A first for any major European car is the availability of digital radio on some versions of the new Astra, while for the Astra product class first are electronically controlled chasiss (IDS+) and AFL (Adaptive Forward Lighting). The Opel Astra Classic III from Bochum was offered for sale as 5-door hatchback and estate in some Eastern European markets[which?]. At the end of 2012, the Astravan was replaced by the new Opel Combo D (whom the Astra H had already ended). During 2005, Opel introduced the OPC version of the Astra GTC (sold as the Astra VXR in the UK) which is powered by an updated version of the 2.0 L turbo Family II engine (Z20 LEH) producing 240 PS (177 kW, 237 bhp) and 320 N⋅m (236 lb⋅ft) of torque. Standard features of the OPC version include sports bodykit and recaro interior, a six-speed manual gearbox, xenon headlamps and 18-inch alloy wheels amongst others. This vehicle was sold until late 2009 in Australia and New Zealand by Holden Special Vehicles as the HSV VXR. HSV VXRs are sold as standard with full leather trim, climate control, 6 disc CD and 19-inch alloy wheels. HSV VXRs were badged as per the UK Vauxhall Spec models, but without the usual rear boot badge. Inside the Opel Blitz appears on the steering wheel with an OPC dashboard. The Astra OPC was also sold as the Chevrolet Astra OPC in Chile. In 2006, the Astra TwinTop arrived. (The "TwinTop" name also applies to the smaller Tigra and refers to a retractable hard top convertible version of the car, shared with the Pontiac G6.) The Astra TwinTop has a three-part folding metal roof which sits in the upper half of the boot space, leaving considerable luggage space below it. Still marketed as a four-seater, the rear seating space is smaller than other Astra models. The TwinTop was available in three trim levels with a range of engines in each, including a 200 PS (147 kW; 197 hp) 2.0 L turbo and the 1.9 CDTI diesel in 150 PS (110 kW; 148 hp) form. Launched in January 2007, Australian-market TwinTops came with the Z22YH 2.2 L direct-injection engine with a choice of 6-speed manual or 4-speed automatic transmission which was unique to Australia. The TwinTop was discontinued in November 2010 along with the 3-door GTC, thus replaced by the soft-top surface Opel Cascada. In Brazil, Chevrolet Vectra (Astra H) substituted the Chevrolet Astra on Stock Car. The V8 is still the same, apart that now they use Ethanol instead of Petrol. The Saturn Astra debuted during the 2007 Chicago Auto Show. Intended to replace the Ion as the brand's smallest model, the Saturn Astra was a captive import built in Antwerp, Belgium. It was offered only in three and five-door hatchback body styles, with sales starting on 2 January 2008. Only one engine was available: a 1.8 L U18XER inline-4-cylinder gasoline engine with variable-valve technology producing 138 hp (103 kW) and with an available five-speed manual transmission or a four-speed automatic transmission. The Astra XE was available only on the five-door hatchback bodystyle version; this was the basic trim level for the Saturn Astra. The upmarket XR trim level was available in both the three and five-door hatchback. 17-inch (430 mm) alloy wheels were standard with the XR, while the XE made do with steel wheels and plastic covers. In Insurance Institute for Highway Safety (IIHS) crash tests the Astra earned a Good overall score in frontal impacts, while in side impacts it received a Marginal overall rating. Front and rear head curtain airbags and front seat-mounted torso airbags were standard. General Motors predicted sales of between 30,000–40,000 vehicles a year in the United States. Sales were slow, due initially to a large glut of unsold Ions and later the uncertainty surrounding the Saturn brand's future. In 2008 only 11,968 were sold in the US and in 2009 this fell to 6,298. With a large number of unsold cars remaining on dealer lots, GM announced it would end import of the Astra. In June 2009, GM announced its intention to sell the Saturn Corporation to Penske Automotive Group but this never was concluded and in 2010 General Motors discontinued the Saturn brand. The successor to the Saturn Astra in the North American General Motors lineup was the Buick Verano, introduced for the 2012 model year. The Verano is derived from the succeeding Astra J. Engines were available with 5 and 6 speed manual transmission, Easytronic semi-automatic gearbox with 5 speed, and also 4 and 6 speed automatic transmission. In the beginning there were petrols 1.4 90 PS, 1.6 105 PS, 1.8 125 PS and new 2.0 Turbo engine with two versions: 170 PS and 200 PS. Diesel lineup were 1.3 CDTI with 90 PS, 1.7 CDTI with 80 PS, 100 PS, and 1.9 CDTI engines with 120 and 150 PS. During production some engine got more power like 1.6, 1.8, 1.7, 1.9 and 2.0 Turbo with 240 PS was introduced in 2005 in OPC/VXR version. 1.3 CDTI 90 PS was introduced in 2005 and he replaces 1.7 CDTI with 80 PS. After restyle at end of 2006 / beginning of 2007, new engines were introduced: 1.6 Turbo engine with 180 PS which replace 2.0 Turbo with 170, and 1.7 CDTI with 125 PS. The Astra J is based on the General Motors' Delta II platform and debuted at the 2009 Frankfurt Motor Show in Germany. The car has taken most of its styling from the new Opel Insignia, with many of the higher options fitted as standard. Full production came on line at Vauxhall's Ellesmere Port Plant at the end of September 2009. Deliveries began in December 2009. Originally referred to as the "Astra I", it received the "Astra J" name instead to avoid confusing the letter I for the number 1. The Astra was developed at Opel's 'International Technical Development Center' (ITDC) in Rüsselsheim and continues Opel's design language, ‘sculptural artistry meets German precision’ first introduced on the Insignia. The Astra features a torsion beam rear suspension with Watt's link. Infotainment and car navigation systems are supplied by Bosch. The Opel Astra came third in the European Car of the Year award in 2010. The station wagon version of the Astra - dubbed the 'Sports Tourer' by Opel, debuted at the 2010 Paris Motor Show, and went on sale shortly afterwards, with a starting price of £16,575 for the ES version, then Exclusiv, SRI and SE versions, with the SE costing from £20,345. This is cheaper than the previous estate, but has more standard equipment. The adoption of the "Sports Tourer" name finally brought to an end Opel's traditional "Caravan" designation for its station wagon derivatives. Shanghai GM launched the Chinese version of the Opel Astra hatchback, which is badged as the Buick Excelle XT. This car went on sale in January 2010. Three engines were announced: Ecotec D-VVT 1.6 L, 1.8 L and 1.6 L Turbo. The saloon version of the Astra was first presented at the 2012 Moscow International Automobile Salon. The 4-door saloon has a number of names depending on market: Buick Excelle GT in China, Buick Verano in North America and Opel Astra sedan/saloon elsewhere. This version, which was imported to Europe from China, is not sold in the United Kingdom, although it is available in some other right hand drive markets, such as Ireland (as the: Astra Saloon), Malta, and South Africa. A 3-door version dubbed Astra GTC was introduced in July 2011. Externally, it retains very few design elements of the old 5-door model. It has a sportier appearance, with a much more 'sculpted' chassis. It features a HiPerStrut front suspension from the Opel Insignia OPC which helps alleviate torque steering. A Watt's linkage is present in the rear suspension, to minimize lateral movement of the axle. The wheelbase is enhanced to accommodate wider low-profile tyres. Similarly to the Astra H GTC, a 'panoramic windscreen' option is available. The Astra GTC was awarded a 5 star rating for its performance under Euro NCAP safety tests. In late 2013, a new 1.6 Turbo EcoTech engine with 200PS output replaced the older 180PS engine of the same capacity, meaning the 1.6 Turbo replaces the BiTurbo Diesel as the fastest non-OPC model in the range. The GTC is built in Gliwice, Poland, with a range of models & petrol and diesel engines. In the UK, the GTC includes the SRi and VXR models. There are three models of the GTC, the SRi, Limited Edition, and the VXR model. Available colours are Power red (Solid), the Brilliant colours are Summit white & Flaming yellow, The Metallic colours are Granite grey, Deep sky blue, Carbon flash, Sovereign silver & Flip chip silver, The Pearlescent colours are Emerald green & Asteroid grey. The VXR also has Flash blue. The OPC trim of the Astra GTC has been available since 2012. This car features a turbocharged 2.0 L direct injection engine with a power of 206 kW (280 PS; 276 hp) and torque of 400 N⋅m (300 lb⋅ft), HiPerStrut front suspension, a mechanical limited slip differential, an electronically controlled FlexRide active suspension, and Recaro-style sport seats, OPC badge on gear knob, steering wheel, and on instrument dials and different and distinctive front and rear bumper, rear standard spoiler as well as optional OPC spoiler compared to GTC version. It comes with 19 inch alloy rims as standard and optional 20-inch alloy rims which are lighter than those 19-inch. 0 to 100 km/h (62 mph) time is 6 seconds and top speed is limited to 250 km/h (155 mph). This generation Astra was not available as the commercial version Astravan. But in The Netherlands, the Astra Sports Tourer was available as Astravan at special order. Engines are available with the 5-speed or 6-speed manual transmission. The only optional available automatic transmission is the 6-speed with active select mode, which can be ordered for the 1.4 turbo, 1.6, 1.6 turbo and 2.0 CDTI depending on region. From 2011, Start/Stop was introduced in certain countries on some models, and from 2012 an overboost function was added to the 1.4 turbo. [Engines with (S/S) are in bold in CO2 column]. The engines are Family 0/Family 1/Ecotec/MGE (gasoline), and MultiJet/Circle L/GM MDE (diesel). In February 2014, Opel introduced its all-new engine - GM Medium Diesel engine, the so-called "whisper diesel" 1.6 CDTI engine with 136 PS, and later with 110 PS. In June 2012, a facelift was announced. Visual changes occurred at the front and back of the hatchback and sports tourer, and a saloon was introduced to certain markets. Engine wise, the 2.0 BiTurbo CDTI 195 PS from the Insignia from autumn 2012 and a new 1.6 L 170 PS turbocharged SIDI Ecotec direct injection unit from the new MGE engine family is available from early 2013. Opel launched a brand–new Astra at the Frankfurt Motor Show, in September 2015. The Astra K is smaller (5 cm), and lighter (up to 200 kg) compared to Astra J. Although it is smaller on the outside, Opel claims it is bigger on the inside, than the previous Astra J. Depending on the model and trim level it is up to 200 kilograms - at the very least 120 kilograms - lighter than its predecessor. The completely new vehicle architecture plays a major role in the weight reduction. Every component was checked for compact design and lightweight materials. The bodyshell weight alone was reduced by 20 percent from 357 to 280 kilograms. Additional, chassis-related measures resulted in another 50 kilograms of weight reduction; these include high-strength and ultra-high-strength low-weight steels, compact subframes as well as weight reductions to the front and rear axle. Rear suspension is torsion beam (only with Watts linkage on top engines), and MacPherson struts at the front. Available engines are 1.0 3-cylinder, 1.4 4-cylinder petrol engines and 1.6-litre diesels. It will be available with new full–LED frontlight techniques, A screen in the dash which connect to Android or iPhone comes as standard. This system is already available, in both the Corsa E and Adam. Engines are available with the 5-speed or 6-speed manual transmission, and the newly developed 5-speed semi-automatic EasyTronic 3.0 which is only available for the 1.0T SIDI engine. The only other available automatic transmission, at the beginning of production, is the 6-speed with active select mode, which can be ordered in late 2015, for the 1.4 SIDI Turbo with 150 PS, and 1.6 CDTI with 136 PS. Buyers can choose the Start/Stop system for all engines as an extra feature, except the 1.0T which will have system as standard. All engines are new and recently developed by Opel - 1.0T SIDI, 1.4T SIDI (which sees its debut in the Astra K in 2015) and the naturally aspirated version of it (which will be available later in 2015), and the so-called "Whisper diesel" 1.6 CDTI. All turbocharged petrol engines use the Direct Injection Fuel system. Opel are offering the ecoFLEX range for 1.0T, 1.4T and 1.6 CDTI engines which have same amount of power, but less CO2-emissions (g/km) and lower fuel consumption. The entire ecoFLEX range have Start/Stop as standard, low rolling resistance tyres and aerodynamic tweaks for reduced drag for lower CO2-emissions. The 1.4T SIDI ecoFLEX version have less torque, rated at 230 Nm at 2.000-4.000RPM. Manuel Reuter's Nürburgring 24h winning Astra which formerly competed in the DTM. An Astra won the Andros Trophy for three consecutive years starting in 2000. An Astra was used in the 1994 Super Tourenwagen Cup season. In 2002, 2003 and 2006, three different drivers were European Rallycross Champions in the Division 2 driving Astras. The 2003, 2004, 2006, 2007 and 2008 runners-up also raced in that car. Christian Ledesma was 2004 TC 2000 champion with an Astra and Matías Rossi took that title in 2006 and 2007. A rally version of the Astra was built to the FIA 2-Litre World Rally Cup. The car finished second in class on the 1998 Rally of Great Britain, and claimed the British Rally Championship for manufacturers in 2000. The Astra has been used in the shape of silhouette racing cars as well. It was featured in the Deutsche Tourenwagen Masters from 2000 to 2003 (Manuel Reuter was runner-up in 2000) and overall winner of the 2003 Nürburgring 24h race and the Stock Car Brasil from 2004 to 2008 (Giuliano Losacco won the tournament in 2004 and 2005). In 2009, the Astra G body was replaced Stock Car Brasil by a Vectra, which is in fact the same as the Astra H.
The car has also been raced in the Russian Touring Car Championship, the 2004 European Touring Car Championship season, the 2006 Swedish Touring Car Championship season, the 2008 European Touring Car Cup and the 2013 European Rallycross Championship season. ^ "Opel to launch in Australia". carsguide.com.au. Retrieved 22 May 2011. ^ "Opel abandons Australian arm after less than a year after poor sales". Dailytelegraph.com.au. Retrieved 27 December 2013. ^ "Opel to Build Vehicles for Holden in Australia and New Zealand". media.gm.com. Retrieved 14 July 2015. ^ Carscoop Carscoop. "Holden to Bring Astra VXR, Cascada and Insignia VXR to Australia and New Zealand". Carscoops. Retrieved 14 July 2015. ^ "'09 SA Car of Year named at Jozi banquet bash". IOL. 17 March 2009. ^ Samahá, Fabrício. "Chevrolet Kadett". Carros do Passado [Cars of Yesteryear] (in Portuguese). Best Cars Web Site. p. 6. Retrieved 2 November 2012. ^ Binder, Alan K.; Ferris, Deebe, eds. (2000). General Motors in the Twentieth Century. Southfield, MI: Ward's Communications. p. 151. ISBN 0-910589-52-6. ^ "Opel. Opel In Italy". Car-cat.com. Retrieved 2 October 2010. ^ "Opel. Opel In South Africa". Car-cat.com. Retrieved 2 October 2010. ^ "History". ukravto.ua. Ukrainian Motor Corporation. Retrieved 25 December 2015. 2004 Opel Astra Classic motor car was put into serial production. UkrAVTO Corporation initiated Capital (Stolychne) Autoshow annual project. ^ "Ошибка 404 .. - GM-press.com // обзоры автомобилей, новинки автопрома, советы автомобилистам,курьезные случаи, аварии". Archived from the original on 10 March 2011. Retrieved 14 July 2015. ^ Valeria, Marco (4 June 2005). "Chevrolet arremete en la venta de modernos taxis". Las Últimas Noticias. Archived from the original on 16 February 2006. Retrieved 25 December 2015. ^ "Ediciones Especiales – El Mercurio". Edicionesespeciales.elmercurio.com. Retrieved 1 May 2009. ^ a b c "Expert online, March 19, 2008". Expert.ru. Archived from the original on 11 August 2010. Retrieved 2 October 2010. ^ "Autoreview, No. 3, 2008". Autoreview.ru. Retrieved 2 October 2010. ^ "Newsru.com, July 29, 2005". Newsru.com. 29 July 2005. Retrieved 2 October 2010. ^ "Der letzte Astra". RuhrNachrichten.de. 28 April 2014. Retrieved 22 February 2015. ^ "Opel Astra III NB – zakończenie produkcji". Automotiveblog.pl. 11 July 2014. Retrieved 22 February 2015. ^ Satyam. "Welcome to GMArabia.com". Gmegypt.com. Archived from the original on 9 August 2010. Retrieved 2 October 2010. ^ "Friedhelm Engler". Cardesigncontest.com. Archived from the original on 14 January 2012. Retrieved 14 November 2012. ^ Ciferri, Luca. "Fiat, General Motors developing joint Stilo-Astra platform". autoweek.com. Retrieved 6 November 2015. ^ "Motoring: Opel Astra 4-door for your eyes only". Sunday Mirror. 9 March 2008. ^ Homola, Peter (23 August 2007). "GM Launches Opel Astra Sedan Output in Poland". WardsAuto.com. Archived from the original on 19 November 2008. Retrieved 30 January 2008. ^ "Autoreview, March 2008". Autoreview.ru. Archived from the original on 9 August 2010. Retrieved 2 October 2010. ^ "Saturn's next Opel: 2008 Astra". AutoWeek. Retrieved 7 December 2006. ^ "Inside Line: 2007 Chicago Auto Show: Saturn Takes the Wraps off Euro-Flavored 2008 Astra". Edmunds.com. Archived from the original on 10 February 2007. Retrieved 8 February 2007. ^ Gastelu, Gary (8 May 2008). "2008 Saturn Astra 3-Door XR". Fox News. Archived from the original on 10 May 2008. Retrieved 8 May 2008. ^ "Saturn Astra XR". Autoweek. Retrieved 28 December 2007. ^ "IIHS-HLDI: Saturn Astra". Iihs.org. Archived from the original on 4 September 2009. Retrieved 1 May 2009. ^ "GM Media Online". Media.gm.com. 5 January 2009. Archived from the original on 23 April 2009. Retrieved 1 May 2009. ^ "2009 Saturn Astra Specs and Features - MSN Autos". MSN Autos. 11 August 2009. Retrieved 11 August 2009. ^ "Opel Astra: design story". Car Body Design. 23 June 2009. Retrieved 14 November 2012. ^ "GM Media Online: All-new Astra Set to Take Compact Class by Storm in 2009". General Motors. 8 September 2008. Archived from the original on 8 September 2008. Retrieved 26 December 2015. ^ "Car News Blog: 2010 Opel Astra to debut at Frankfurt". Automobile mag. 8 September 2008. Retrieved 21 October 2008. ^ "Opel Astra J Gebrauchtwagen kaufen und verkaufen bei AutoScout24" [Opel Astra J used cars for sale or to sell] (in German). AutoScout24. Archived from the original on 7 June 2015. Retrieved 5 June 2015. ^ "Bosch Media Service" (in German). Bosch-presse.de. Retrieved 14 November 2012. ^ "New Car Reviews – Opel Astra saloon". Carzone.ie. Retrieved 27 December 2013. ^ "New Opel Astra 4-door - the elegant compact saloon car - Opel Malta". opel.com.mt. Archived from the original on 15 July 2015. Retrieved 14 July 2015. ^ "What a stunner! Astra booted". Wheels24. Retrieved 24 July 2014. ^ "Opel Media – Europe – Company". media.gm.com. Retrieved 14 July 2015. ^ "Compare Models - Vauxhall GTC - Vauxhall". www.vauxhall.co.uk. ^ "Vauxhall GTC - Choose Trim, Engine & Options – Vauxhall". www.vauxhall.co.uk. ^ "Opel Media – Europe – News". Media.opel.com. Retrieved 14 November 2012. ^ "Premiere in Geneva: Opel Astra 1.6 CDTI Needs Just 3.7 Liters Diesel". media.opel.de. Retrieved 5 February 2014. ^ "The new Opel Astra line-up: More variety, engines and high-tech features". Media.opel.com. 15 June 2012. Retrieved 14 November 2012. ^ "Pure Pleasure: Highly Efficient 1.4-Liter Turbo in the New Astra". Media.opel.com. Retrieved 17 June 2015. ^ "Affordable High-Tech: New Opel Astra Tough on CO2 and Prices". Media.opel.com. Retrieved 12 June 2015. Wikimedia Commons has media related to Opel Astra.